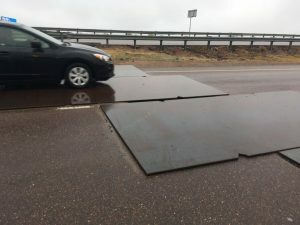 El Paso County Department of Public Works will begin paving the damaged section of S. Academy Boulevard this afternoon and traffic is now down to one lane on the Bradley Road bridge on the southbound side of Academy. Public Works crews originally thought paving would have to wait until Monday, but saw an opportunity to complete the repairs today, and are working on the issue now. Drivers should expect slow speeds through that stretch of road, and should proceed with caution as work continues into the afternoon on Friday. The County urges travelers to use caution through the area. The paving and continued road work is in response to a hole that developed in the asphalt Thursday on the seam of the bridge that crosses over Bradley Road. Eventually, County crews had to dig out an area through all three lanes of S. Academy Blvd. and are working to pave that opening now. Academy Blvd. 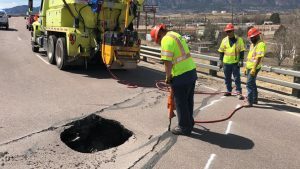 is now re-opened after El Paso County Department of Public Works crews dug out and repaired a sizeable hole which had developed under the road. However, motorists should expected reduced speeds and a law enforcement presence while work continues. The County urges travelers to use caution through the area. The hole developed near the seam where the roads meets up with the bridge that crosses over Bradley Road. Eventually, County crews had to dig out an area through all three lanes that was about three feet wide by five feet deep. Colorado State Patrol has closed down the westbound portion of S. Academy Blvd between Drennan Road and the Bradley Road onramps to allow El Paso County crews to address a large pothole in the middle lane. The pothole is near the bridge where Academy Blvd. crosses over Bradley Road.